I’m feeling very inspired by gray right now – it’s an easy layering neutral that can be worn year-round and is a chic alternative to black or white. A few gray pieces I’d like to pick up for this fall include this IRO leather jacket, these boyfriend jeans and this slouchy sweater. I’m also seconds away from pulling the trigger on this oversized boyfriend coat and this ostrich-feather fringe dress – so cute, right?! Loeffler Randall also has some really gorgeous grays this season too. These sandals and these pumps take the cake, but I also really love this shearling backpack! If you couldn’t tell by this gorgeous velvet headboard, One King’s Lane is killing it right now. This pretty navy bar cart and these gold-plated oysters would be totally welcome at my house. If only I could afford this bamboo green Kelly bag… Ah, to dream! If you’re hoping to brighten up your dining space, a mix and match of this chair and this chair would be so fun! Speaking of color, I’m obsessed with this turquoise hide bench and this bone-inlay chest! Gorgeous. I was perusing the sale section on Shopbop yesterday (a constant source of entertainment for me), and found a bunch of great deals. Nothing like finding a minimalist pair of K. Jacques sandals marked down! The pale gray shade is super wearable spring through fall. Flared jeans are back for fall and this pair by Rag & Bone is calling to me. Speaking of minimalist style, these strappy DKNY heels are so me. Looking for the perfect LBD for fall? This number from Rachel Zoe is about as chic as it gets! This Theory pencil skirt is a work wardrobe essential – I’d pair it with a fuzzy sweater (half-tucked, of course) and mules for a fun fall ensemble. Click here to shop the sale! I love grey too, love these picks! I am absolutely smitten with that coat! I have a ton of jackets (wool, leather, tweed, etc. ), but I don’t have any long winter coats so I’m currently on the hunt for one! That Loeffler Randall bag is a beauty! I got one of their new ones but this is amazing. You and me both, I have been loving grey and also dark blues. That Loeffler bag is amazing, the green accent, amazing. Already obsessed with hunter green for the fall! that rochas leather pouch is absolutely stunning! LOVE the grey and emerald combo! That shirt dress is gorgeous. Drooling over that Max Mara coat and those wool pumps! Well, #5 is all kinds of fun, whereas #10 and #13 scream CHIC! Great finds, per ush, Merritt. 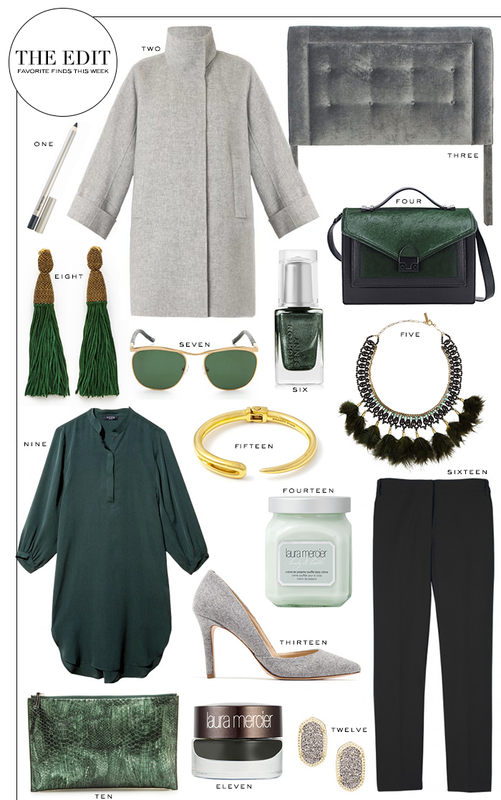 Love that hue of green for fall, so perfect! Great collection. I really like the tassel earrings..remind me of pineapples. Love the green and grey combo! Those grey pumps are amazing! That coat and calf-hair bag are killing me….so many great picks for fall! great picks – I’ve had my eye on that brandy pham bracelet for a while now! Love that headboard and those gray heels! So pretty! I am in love with this color scheme! Gray is absolutely my favorite color for fall right now and the emerald green is a stunning pair. Loving that grey coat!!! To die!